16 years in the making: 32 secret rooms, 91 switches, 244 activators, 322 sector effectors, & 80 TOUCH PLATES later, it's finally done; Castle Quest, a single player / co-op adventure. Ok I'll admit, maybe I haven't worked on it much in the last 14 years lol, but I have recently thanks to my discovery of eduke32. I was just trying to hype up my level but still those numbers are no lie, and there is well over 100 hours in it, if not 100's, and it has never been released... until now. These maps are full of non-stop surprises (hence all the touch plates and activators); whether you throw a switch or you're just walking down a hallway, lookout! Saving often might be a good idea, or play co-op so you can just respawn. I made lots of puzzles you have to solve, and with 32 secret rooms, explore every crevice. There is always some type of boss or big show down at the end of each level, so you'll love that. Well I hope you have an awesome adventure, let me know what you thought. Did you know that Duke Nukem's lineage dates back to the Middle Ages. The full name of the Duke Nukem you all know and love is actually Duke Igthorn Nukem the 21st. This is a story about Duke Nukem the 1st. One day when his wife and little boy went out shopping, he awoke in a haze and said to himself "what is that crap on the ground, and what is this in my hand". The next thing you know aliens are attacking him from all sides. After killing them all with his newfangled weapon, he decided to get on with life and see if he could use it to chop some wood. Nope, "It's those bloody damn things again!" he says, and then something twinged in his brain, he'd had enough. "I'm going to kill every damn one of those bastards!". About a week went by since "the incident" as his wife liked to call it, and Duke the 1st decided to go to the town square. As soon as Duke gets there he sees his mistress, he stares at her as she dances for him like a Barbarian freak. When Bam!!! The next thing you know the whole thing blows up, public girls and all. Well something in Duke got triggered all over again, good thing he brought his boom-stick with him! The alien problem is still rampant and so Duke decided to start his own extermination company, like the Ghost Busters. He took a call to clear out a random block in suburbia, which includes a house and two office buildings, no problem right. O ya, and the owner of the house stressed to be careful with his new double pane glass windows. 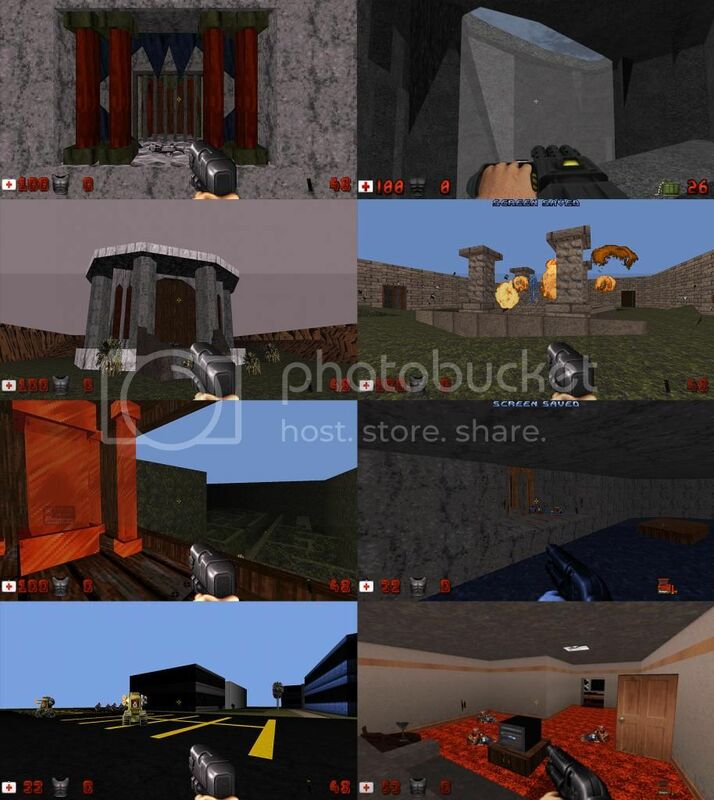 7 maps total: Castle Quest levels 1 - 4, the Castle Quest expansion, the Castle Quest ending, and Suburban Quest. It also has a new user.con file which changes the quest titles and adds new music, and it comes with 2 .def files to modify Duke HRP, and backups of those two files with the extension of .orig. For single player the game was meant to be played on 'Let's Rock', but if it's too hard 'Piece of Cake' gets rid of 1/3 - 1/2 of the enemies. 'Come Get Some' will be so hard it's meant for multiplayer, but there is a lot of additional ammo (maybe too much) in this mode, so single player should be possible, let me know if you beat it like this. I would set the texture filter to 'nearest' or similar, that's how it's intended to be seen. If you choose 'linear' the enemies are real blurry, which happens to make them look too dark for my level. Any unit with a custom all green pallet will look especially horrible. Just install it in a folder called CastleQuest, and put that folder in the same folder as eduke32.exe. Right after you click eduke32.exe, at the very bottom where it says "Custom game content directory:", click the down arrow and choose Castle Quest, then click Start. Go to Options - Video Setup, and make sure the 'texture filter' is NOT set to anything linear. ---*---*--- To turn off Castle Quest just don't choose Castle Quest when starting eduke32. 1. 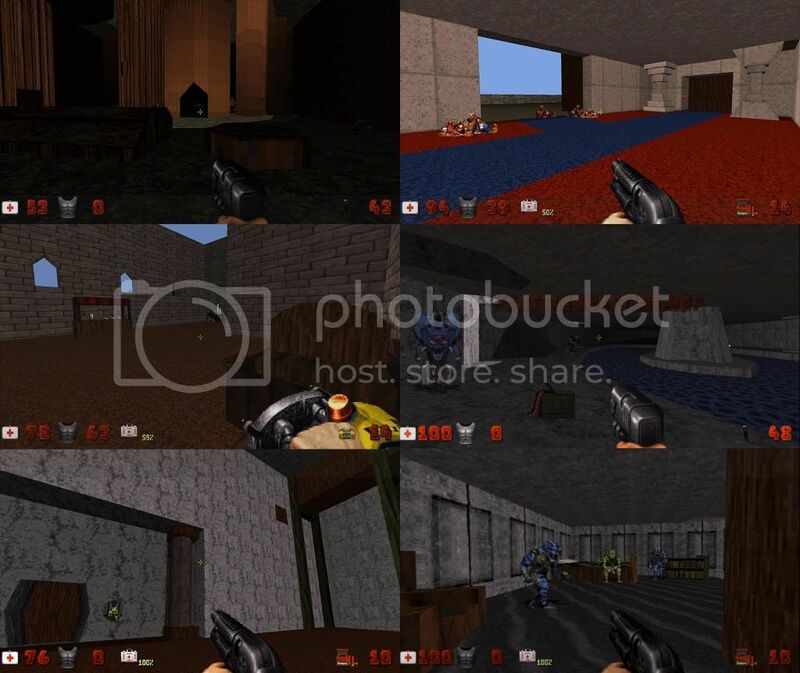 Download Duke3D HRP v5.2 FULL SFX (770 MB) here: http://hrp.duke4.net/download.php and install it to a folder called Dukehrp. 2. After it extracts, go to that folder. Copy (overwrite) your 1.3 or 1.5 duke3d.grp file to the new 'Dukehrp' folder you just made. 3. Inside the Dukehrp folder is a folder called 'autoload', go to it and unzip both of the zips there, and then delete the zips. 4. Extract all of the files (and there is one folder) from CastleQuest.zip to the 'autoload' directory (DO NOT make a new folder called CastleQuest), allow it to replace both duke3d_hrp.def, and sprites.def. The new duke3d_hrp.def will allow the new music to work, and the new sprites.def will put the old sprite monsters back. 5. Now go back to the 'Dukehrp' folder and run eduke32. At the very bottom where it says "Custom game content directory:", click the down arrow and choose 'autoload', then click Start. 6. Go to Options - Video Setup, and make sure the 'texture filter' is NOT set to anything linear. ---*---*--- To turn off Castle Quest just rename USER.CON (in the 'autoload' directory) to USER.CONcq and also rename GRABBAG.MID (in the 'autoload' directory) to GRABBAG.MIDcq. // Otherwise the 1680_trooper gets messed up. When you first double click eduke32, you can check Polymer. It wasn't designed for it, but it still adds plenty of lighting. For instance, I was digging the lighting from the fire at the very start of level 1. I noticed this option bogs down my computer a lot more; looking at that fire, my framerate went from 200 to 58. My biggest complaint would be that it gives away a lot of my hidden switches with all that light. It was designed on 1.3 and so it works on all versions. There is a new User.con file that adds the new music and changes the menu titles, but it's not really needed. The User, Game, and Defs .con files are 1.4/1.5 so if you're running 1.3 and run in to any trouble using a program other than eduke32, that might be the cause. Well lets see, I started out making levels for doom, big surprise right. When I saw how cool the level editor was for Duke3d, I was hooked. Much like how I had to know every Dos command, I also wanted to learn every single trick the level editor had to offer, and eventually I learned them all. I was never big on the normal Duke levels, but I loved Duke it Out in DC, and the Platoon total conversions. 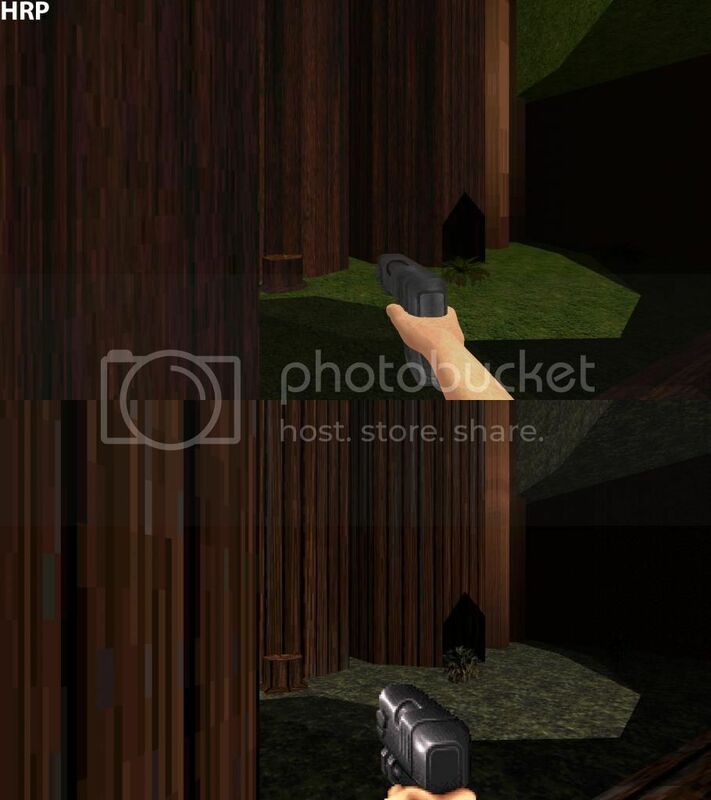 I think my inspiration for these levels came from them, and also this amazing dukematch level called CHURCH.map, known as Church3.zip here http://ftp.gameaholic.com/pub/mirrors/ftp.cdrom.com/3drealms/duke3d/maps/a-e/. I only made dukematch levels for a while and then my first attempt at a single-player / co-op level was Suburban Quest. After that I made the first Castle quest level, but it was actually a death-match level called Woods. Later I turned it in to a co-op level and just recently it was turned in to the first level of Castle Quest. The second Castle Quest level is the true blue original first level of Castle Quest, I spent a long while on it. When that was finally done I spent forever making the second level, a goblin underground. Next I made a super short boss level which I recently added some acrobatics to. The expansion was my grand finale, that level is big. I never feel quite done though, and so my last touch was 'The Ending' level. The screenies are looking good. Duke Igthorn is actually the villain from the show Gummy Bears lol. Doors and elevators have sound. Removed the toilet flush and subway sounds from the User.con file. You can now go under the tree in level 2. You can no longer cheat the bush maze in the expansion level. Added some more boats to the expansion level. Rearranged some buttons in the pick 2 game (level 3). Replaced a couple steep hills with elevators in level 4. Added a garage door and moved the driveway in Suburban Quest. Fixed a secret room that had two sectors in it that were both tagged as a secret room. Traditional: Delete the old CastleQuest folder and install this in a new one named CastleQuest20. When you run eduke32, choose CastleQuest20. HRP: Just extract the zip to the autoload folder and allow it to replace / overwrite all of the old files with the new ones.